Back on Santa Monica Blvd I had to make a stop at Benitos (and Pili's). 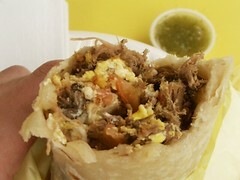 The carnitas burrito and machaca burrito never seemed to fail me at Benitos, though the rest of the menu is hit or miss. This being the morning, I went with the huevos filled machaca. Delicious. This Benitos Taco Shop meal was rated: 7.7. Sunday, July 23, 2006 by Jonah.